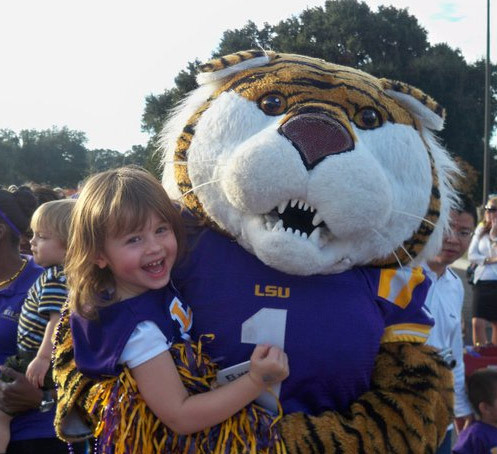 My little cheerleader and Mike the Tiger. Geaux Tigers! The end of summer signals many new beginnings, and one of the more anticipated: kickoff. There is much ceremony in the first pitch of Opening Day, but it’s all pomp: the pitch is over in a flash. Not so for a kickoff. Nothing quite matches the drama. There are enormous stadiums filled with color, the thunderous sound of tens of thousands of fans, and the sound of cleat meeting ball, sending it hanging high into the fall sky. For all of its brute physicality, no other sport combines grace, psychology, technique, and strategy like football. Most other sports use a sphere – an actual “ball” – but football, ever the exception, opts for a shape that is just recognized as a “football” (it’s actually called a prolate spheroid). It is a game filled with contradictions: it manages to be both brash but ever-respectful towards its traditions. A player can literally run over an opponent on one play, then nimbly spin to avoid contact on the next. Football celebrates individual excellence, but only as part of a team. Fans wear a team jersey, but with the name and number of their favorite player. Football shuts down towns on Fridays, Saturdays, and Sundays, and tailgating is a celebration of team and community that doesn’t happen for any other sport. Baseball is known for “October,” when championships are played. Football is known for “August,” when championships are won. Fall is here, and it’s time to go out once more toss the prolate spheroid, and pretend to be like the greats we remember here. We celebrate the lives of the men who play the game we love, men who were not only athletes, but also leaders, teammates, fathers, and husbands who found purpose in the grass of the gridiron. From one football fan to another (Geaux LSU Tigers! ), we bring you 5 condolence messages about football. I joined Legacy.com in 2000 as a part-time Guest Book screener, and since then have served in numerous roles across all parts of the company, from Operations to Sales to Analytics. During my time with Legacy, I had the opportunity to manage our In Remembrance site, dedicated to men and women killed in action in Iraq and Afghanistan. My current role focuses on advertising initiatives and business development. I am originally from Louisiana and now live in Baton Rouge with my wife Rebecca, daughter Evie, and dog Rudy. I enjoy cooking, reading, working in the yard, and loudly cheering on (and tailgating for) our beloved LSU Tigers and New Orleans Saints. This entry was posted in Five Condolences and tagged Condolences, Football, Guest Book entries, Life at Legacy.com, Obituary Guest Books. Bookmark the permalink.